Allied-IX in partnership with DE-CIX installs Layer-2 ethernet switches in each Allied Colo facility in oder to provision local Internet Exchange services to local content. Additionally, Members of Allied-IX can access DE-CIX New York through the DE-CIX GlobePEER Remote Service, providing direct peering via GlobePEER Remote to all ASN’s on the New York exchange. DE-CIX Dallas is Open-IX certified and carrier and data center-neutral, the first truly neutral Internet Exchange in Dallas. 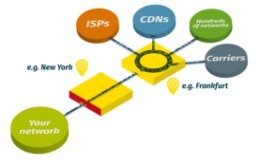 Its neutrality guarantees you to reach networks from different data center operators with just one cross connect. The IX will expand to additional locations across the Dallas-Fort Worth metro region over time.